(a-d) X-ray tomography slices showing the evolution of dendrite growth as the charge increases from 0 to a shorted cell. (e-h) 3D reconstructions of the cells shown in the top panel show the formation of dendritic structures as they begin to form in the bottom electrode until they span the thickness of the electrolyte in the shorted cell (d, h). Credit: Harry, et al. ©2013 Macmillan Publishers Limited. All rights reserved. (Phys.org) —One of the biggest challenges facing rechargeable batteries with lithium (Li) electrodes is the growth of dendrites, which can short-circuit the batteries and cause complete failure. Although dendrites do their damage in the battery's electrolyte region, a new study has found that the root of dendrite formation lies deeper, not in the electrolyte but in the underlying electrode. The discovery could transform approaches to preventing dendrite formation by showing that inhibiting the growth of subsurface dendrite structures in the electrode before they extend into the electrolyte may make more sense than attempting to suppress dendrite growth at more advanced stages in the electrolyte. 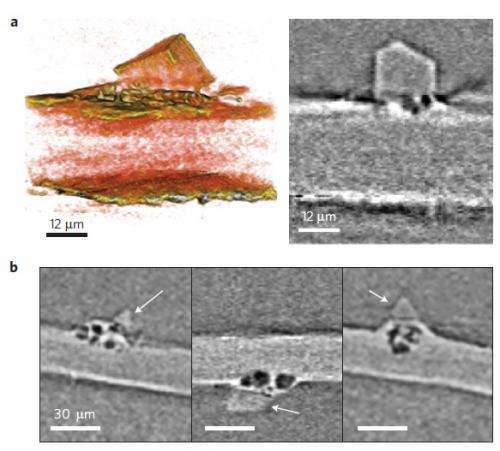 The researchers, Katherine J. Harry, et al., from the University of California, Berkeley; and Lawrence Berkeley National Laboratory (LBNL), have published a paper on the discovery of subsurface structures as the root of dendrite formation in a recent issue of Nature Materials. "Virtually all designs for dramatically increasing the energy density of rechargeable Li batteries for applications such as electric vehicles are based on Li metal anodes," coauthor Nitash Balsara, Professor of Chemical Engineering at Berkeley, told Phys.org. "Our work provides new fundamental insight into the failure mechanism of this anode; to our knowledge no one suspected that non-conductive contaminants might be responsible for dendrite nucleation. It also demonstrates the power of synchrotron hard X-ray tomography, a relatively new technique for studying processes that occur inside batteries." Although dendrites have been widely studied, they have always appeared to emanate from the surface of the Li electrode material, with the bulk of the tree-like dendrite occupying the electrolyte. When the dendrite's "branches" fully cross the electrolyte and reach the opposite electrode, current passing through the dendrite can short-circuit the battery. This is the picture that has been revealed by a variety of imaging tools, including optical and electron microscopes, nuclear magnetic resonance, and magnetic resonance imaging. (a) A 3D reconstruction of two dendrites show the subsurface structures below the protrusions into the electrolyte. (b) A rotated view. (c) An SEM micrograph of the same cell contains no direct evidence for the presence of subsurface structures under the protrusions. Credit: Harry, et al. ©2013 Macmillan Publishers Limited. All rights reserved. In the new study, the researchers have for the first time used synchrotron hard X-ray microtomography, an imaging tool at LBNL's Advanced Light Source, which is one of the world's brightest sources for ultraviolet light and X-rays. Unlike previous methods, this technique enables the researchers to image structures not only in the electrolyte, but also in the electrodes on either side of the electrolyte. Using this technique, the researchers could watch as the seeds of dendrite formation appear in the electrode material, and then as the dendrites continue to grow into the electrolyte as the battery is repeatedly cycled. The researchers observed that in the early and intermediate stages of battery cycling, the majority of the dendrite's volume lies within the electrode, not the electrolyte. Only at the more advanced stages does the bulk of the dendrite volume lie within the electrolyte. Yet when imaged with a commonly used scanning electron microscope, none of the dendrites in the electrode are visible. (a) A 3D reconstruction of a crystallite at the electrolyte/electrode interface. (b) X-ray microtomography images of dendrites with crystallites at their base. Arrows point to the crystallites. Credit: Harry, et al. ©2013 Macmillan Publishers Limited. All rights reserved. For the time being, the researchers aren't sure what the underlying mechanism is by which the dendrites nucleate and grow within the electrodes. They hypothesize that contaminants in the Li material may be the cause. The manufacturer of the Li foil used in this study lists a number of elements other than lithium, the most abundant being nitrogen. Using the X-ray tomography technique, the researchers could see crystalline contaminants appearing as bright specks in the Li electrode. They note that every dendritic structure that they observed has a bright speck at its base, which suggests that eliminating these contaminants may be key to solving the Li dendrite problem. In the future, the researchers plan to further investigate the underlying causes of subsurface dendrite formation, as well as better understand the role of electrolyte properties in dendrite growth. "We are working on approaches to eliminate non-conductive impurities from the Li metal anodes," Balsara said. "These anodes should exhibit very different failure modes, and batteries built with these anodes should last longer than those built with currently available Li metal foils." Interesting. 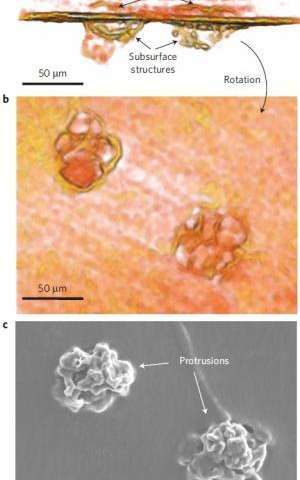 Contaminants as the source for nucleation isn't too surprising (what else could it have been? Other lattice defects of some kind? ), but that the structure grows first within the electrode is a surprise—that they grow at all subsurface is pretty amazing.